Be the first to share your favorite memory, photo or story of Ginger. This memorial page is dedicated for family, friends and future generations to celebrate the life of their loved one. 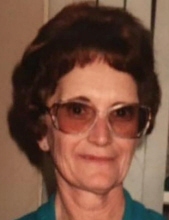 Ginger Lee Moore, 74, of Elk City, Oklahoma was born on December 18, 1944 in Elk City, Oklahoma to James Winford and Dorothy Ann (Dye) Fisher. And shortly thereafter she was adopted by her grandmother, Goldie Fisher. She went to walk with her heavenly Father on April 4, 2019 in Elk City, Oklahoma. Ginger was raised on the family farm and attended school in Elk City, Oklahoma. She married Franklin Chervenka in 1961 and had three children; Tony Lee, Larry Leo and Randy Jo. Ginger worked at Goldie’s Café until its closing in 1967. She enjoyed being a homemaker. Ginger also worked at Pizza Hut for several years until her health forced her retirement and while there she was lovingly known as “Grandma Ginger” to her co-workers and customers. Cherishing her memory is her son Larry Chervenka and his wife, Terri of Elk City, Oklahoma; one granddaughter; Kassi Chervenka of Elk City, Oklahoma; one grandson; Bradley Chervenka and his wife, Michelle of Canute, Oklahoma. She is preceded in death by two sons; Tony Lee Chervenka and Randy Jo Chervenka, one grandson; Kenny Chervenka, one granddaughter, Kandi Chervenka. Memorials can be made to the Charity of Choice or the Kenny Chervenka Scholarship Fund in care of Martin-Dugger Funeral Home, P.O. Box 707, Elk City, Oklahoma 73648. Online condolences can be sent to the family by using the online guest book at www.martin-duggerfuneralhome.com. To send flowers or a remembrance gift to the family of Ginger Lee Moore, please visit our Tribute Store. Guaranteed delivery before Ginger's graveside begins. "Email Address" would like to share the life celebration of Ginger Lee Moore. Click on the "link" to go to share a favorite memory or leave a condolence message for the family.